It's been weeks since I updated and for that I apologize. My fellow New Yorkers know how it is in the summer; work slows down, people visit the city, the beach begins calling, and little gets done. I recently hosted my former roommate and now friend Vanessa here in New York. While our time together was cut short but the siren calls of the beach, she still had a blast exploring the East Village for a night. Vanessa is a vegan and has been since we lived together in 2008-09. Back then she would eat gluten while frequently complaining about her acid reflux and stomach problems. She would consider going gluten free and would do it for a few hours or days but would quickly begin eating it again. I told her to see a doctor or to try out gluten free for a few weeks, thinking it would help her. Lo and behold, years later, Vanessa was diagnosed with gluten sensitivity and now eats a gluten free and vegan diet. 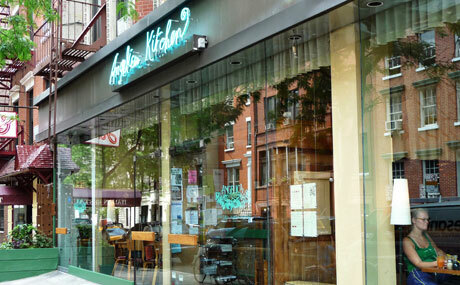 Fortunately I knew where to take her here in New York: Angelica Kitchen, a restaurant I have walked by hundreds if not thousands of times and, supposedly, one of the best vegan restaurants in the city. Having just been to Candle Cafe I was ready to compare the two. Bringing Vanessa to a vegan spot presented an issue because she showed me the best vegan restaurant I have ever been to: Real Food Daily with locations in West Hollywood and Santa Monica. Despite any potential anxiety I had about showing her New York City's vegan food I chose Angelica Kitchen because of its accessiblity for everybody coming to dinner. Upon being seated we immediately popped open a bottle of wine (which brings along a $7 corkage fee). While perusing the menu I was disheartened to see that gluten free options weren't marked on the everyday menu and asked about the gluten free options. Our waitress brought over a laminated paper with the gluten free options. At this point I became even more disheartened, as the options didn't seem so great. Many of the options were, frankly, very boring. We ultimately decided to split two orders of the Walnut-Lentil Paté and an entrée order of Thai Mee Up. The paté was fine; nothing great but served with brown rice crackers so Vanessa and I could eat it. It was pretty plain, flavorless and definitely nothing to write home about. At this point, Vanessa and I, along with our companions Jordanna and Annaliese, were so hungry we couldn't resist the food even though it wasn't very good. split; the menu describes it as "delicate strands of daikon radish, zucchini & carrot, on a bed of garlic-lemon marinated kale, dressed with Thai tahini sauce." I'm not sure how to phrase this delicately but... this dish was bad. Really bad. Flavorless and dull, I practically fell asleep while eating it because I was so bored by my dinner. Annaliese felt the same way about her entrée, which was one of the specials so I don't have a full description for it. The only one who seemed to be almost content with her meal was Jordanna; she ordered the Soba noodles as a side and the Kale salad. The Kale salad had the flavor which the Thai Mee Up was sorely lacking so much that Vanessa and I asked for a side of the dressing on the Kale salad. Suffice it to say, we did not stay for dessert. We considered walking over to Lula's Sweet Apothecary for some vegan dessert but ultimately decided to have a few drinks to wash away the memory of our meal at Angelica Kitchen. 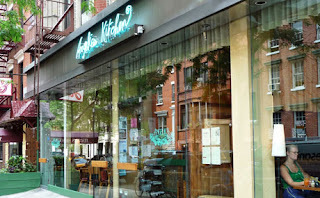 An inattentive waitstaff and boring dishes make Angelica Kitchen a no go in my book. I doubt I will ever go back to Angelica Kitchen.